American produced Academy silver bars due to their unsurpassed quality, superior silver content and spotless reputation are considered one of the finest silver investment choices. These bullion bars are almost always recommended by leading gold and silver investors. Academy silver bars unique locking design makes it very convenient to keep them together in safe deposit boxes or for transportation purposes. In addition, the weight, size and shape of Academy silver bars are meticulously controlled by a special computerized system making all of them absolutely identical. On top of being precisely manufactured, Academy silver bars are 100% tamper proof due to their unique polished surface where any kind of drilling or scratching becomes absolutely obvious. When buying these bullion silver bars you can be absolutely confident that you are paying money for top notch quality investment. Silver investors need to know that with time Academy silver bars might lose the original luster but this fact will not affect their quality and investment value. Store your precious Academy silver bars in hard plastic containers in a safe and climate controlled area to preserve their original appearance as much as possible. 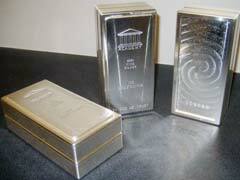 Academy silver bars are produced in two popular sizes, namely 10 oz silver bullion bars and 100 oz bars. Getting 100 oz bars allows you to save money on transportation and premium costs and get more silver value on your dollar. However, owning the smaller 10oz silver bars are also convenient in case you would like to sell a portion of your investment. Another quality silver bullion bars that are very popular among silver investors are Engelhard silver bars and Johnson Matthey silver bars, read our articles to learn more why they are such excellent investment choices.